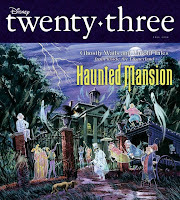 The third issue of Disney Twenty-Three hits the stands this week with a cover story on the Haunted Mansion. Topics include the 1959 expansion of Disneyland, the soon-to-open Walt Disney Family Museum, the upcoming TOY STORY movie, and a tribute to New Orleans Square. Posts on the first two issues can be found here and here. Longtime readers may recall I've been fortunate enough to visit Club 33 on three occasions. Two of those visits are chronicled here and here. Club 33 is a completely awe-inspiring experience for Disney fans: the magic of being allowed inside (! ), the beautiful decor with props from classic films, and food that is spectacularly good. Did you ever see the Haunted Mansion movie? Kind of good, kind of not. No, I skipped that one...just not a Haunted Mansion fan myself (grin). Interested to hear your take on it! I don't want to bother to look up a lot of facts so this won't be as well-written as your reviews. Basically, Eddie Murphy's character, his wife and kids all end up at the Haunted Mansion because of Murphy's go-get-em realtor tactics. The owner displays a great attraction to Murphy's wife, who is an exact ringer for his fiance who was mysteriously killed by *someone*. As we find out, she was killed about 100 years ago.! Meanwhile, mysterious happenings are leading Murphy and the kids into finding out more and more about the house's inhabitants. The owner's working to take Murphy's wife away and his insistence that she really is his dead love come back and she'll remember everything as soon as she marries him (and dies!) were kind of creepy to me. The ending also seemed a little bit wild too; I think the villain was a little too over the top at the end. The ghosts were fun overall though, so a Haunted Mansion fan might enjoy that.